"They do not target the enemies in front of their eyes - they target our house and kill our people"
When the Taliban unleashed a barrage of rockets at Kabul's airport on Wednesday, targeting the plane of visiting US Secretary of Defence James Mattis, streets in the area were devoid of life as residents remained indoors for several hours. A woman was killed, and 11 civilians were wounded in the Taliban attack, according to Afghan officials. In response, NATO's Resolute Support mission in Afghanistan said that US aircraft launched air raids to support Afghan security forces conducting search operations near the Hamid Karzai international airport. "Tragically, one of the missiles malfunctioned, causing several casualties," the mission said in a statement, giving no further details but expressing regret for having harmed civilians. It said an investigation into the incident was under way. Local media quoting Afghan police said the US air raids had wounded at least six civilians. "Afghanistan security forces are weak and that is why we are attacked by both the Taliban and the foreign forces," Kabul resident Mohammed Amin, 50, told Al Jazeera. 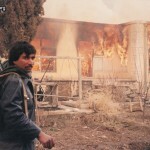 "US troops dropped bombs on a residential area. How can they say it was mistake? We understand one time, two times, but not forever! They kill us, civilians, and call it a mistake all the time." It was not the first time a US bombing attack in Afghanistan had hit the wrong target. An American air raid in 2015 destroyed a Doctors Without Borders (MSF) trauma centre in northern Kunduz province, killing more than 40 people. In July, a US air raid killed 16 policemen in Helmand city. It came about five months after a US attack in Helmand province's Sangin district killed at least 18 civilians, mostly women and children. According to a July UN report, the number of civilians killed and wounded in Afghanistan's violence reached a record high in the first six months of 2017, made worse by the Afghan air force carrying out its own air raids along with US forces. "Air strikes carried out by international and Afghan air forces caused 590 civilian casualties (in 2016), nearly double that recorded in 2015," a separate UN report said, with women and children accounting for more than half of the victims. Haji Rabbani was the one whose family, including four children, were wounded in Wednesday's US air raids, AFP news agency reported. 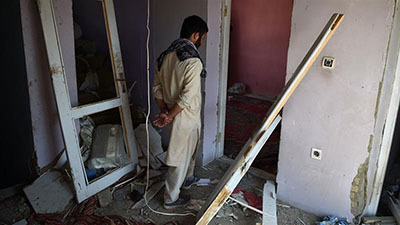 Two bombs struck Rabbani's home - several hundred metres from where the fighters were holed up - destroying an upstairs room, shattering windows and sending debris toppling into the courtyard. "I just got out of the bathroom and came out to perform the ablution when the strike took place," Rabbani told AFP on Thursday. Rabbani said he did not understand why foreign forces had targeted his family when he had no links to the Taliban fighters firing rockets near the airport. While NATO has acknowledged its mistake, Rabbani's family wants compensation, not sympathy - and for the attacks on ordinary Afghans to stop. "They do not target the enemies in front of their eyes - they target our house and kill our people," said Rabbani. Mattis was meeting with Afghan President Ashraf Ghani at the time of the Taliban attack, along with visiting NATO Secretary-General Jens Stoltenberg. Mattis' plane was not hit. At a press conference on Wednesday, both Mattis and Stoltenberg pledged continued support for Afghanistan and vowed to do everything possible so the country "doesn't again become a safe haven for international terrorists". Stoltenberg said NATO is aware of "the cost of staying in Afghanistan, but the cost of leaving would be even higher". He added: "If NATO forces leave too soon, there is a risk that Afghanistan may return to a state of chaos and once again become a safe haven for international terrorism." Stoltenberg also said NATO was committed to funding the Afghan security forces until at least 2020 and would continue to provide them with almost $1bn each year. However, Kabul residents like Amin said they were still feeling unprotected. US forces are "equally killing civilians, just like the Taliban", he said. "If the US can't control the situation why they don't leave us alone? "Our lives are not important to the US troops," he said. Last month, US President Donald Trump hinted he would embrace the Pentagon's proposal to boost troop numbers by nearly 4,000. If confirmed, the undetermined troop increase is to be added to the existing 11,000. Noting that Afghanistan remains the world''s largest producer of opium poppy and a major source of heroin, the presidential determination signed by Obama said although the amount of opium poppy cultivated in Pakistan is much less than Afghanistan, the country continues to qualify as a major drug producing country, with an estimated 1,700 hectares of opium poppy under cultivation.